At some point in the separation and divorce process I started to search for answers. Not about the past, but about my future. I wanted to feel ready and capable to be in a loving relationship. I wasn’t sure I would remarry or that I would find a partner to spend the rest of my life with, but whatever relationship I found myself in, I wanted it to be an enriching experience. This book has remained on my nightstand for three years and is referenced often when in and in between relationships. Revisiting the content reminds me of what any loving relationship needs to have present to be successful as well as helping me maintain a state of mindfulness in my daily life. This simple statement is also a powerful one; understanding guides the ability to be successful in the four elements of love: loving-kindness, compassion, joy, and freedom. It is not about the desire to bring about these four elements, but to actually be able to, which is why understanding is the essence of love. There are wonderful stories in the book to make a more compelling impression on the reader regarding the elements of love as well as an explanation of each element. In all the extensive reading I have done, these simple elements resonate the most for me; they have made a lasting impression. I have not found anything as simple and accurate to define how to love and be loved by another. That is something that is said often and, in my opinion, is true. Work on yourself, heal, and learn to be at peace. Once that is accomplished, a person will be ready to receive another in his/her life. 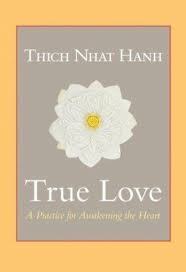 True Love encompasses how to work towards that process as well as the journey towards inner peace. There are sections on restoring peace within yourself, caring for our pain, reconciliation, and coming to life again. There is a powerful story on misperceptions and how, if communication breaks down, a love relationship as well as a family can be destroyed. It is a testament to asking questions in a relationship. Seeking clarity instead of ignoring an issue will ensure misperceptions won’t destroy a loving relationship. The section on mindfulness will help with daily living; how to have a more peaceful, intention-based life. I re-read this section often to remind myself when I find I am getting too busy and need to slow down to experience life more fully. This small book made the greatest impact on me in the last four years of reading about healing, self-discovery, and love. It is a wonderful book to read and re-read often. During the Love & Relationship series these first two weeks in February, it could not be a better time to share this book. I hope Thich Nhat Hanh’s words can help you in one or many areas of your life. Sounds like a wonderful map towards being your best. I’m checking it out, thanks for the reference! It’s a great book RG. I hope it can help you in some way. Where’s my print button…this is a keeper article! I hope you find this book as helpful as I do!